This home is designed for extensive entertaining with a covered flagstone patio which overlooks the sweeping, nearly 1 acre lawn, a powder room which can be accessed directly from the yard, and a separately fenced pool area for peace of mind. Convenient Lower Merion Twp. 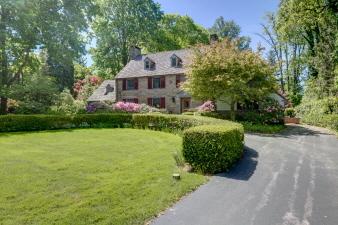 location near the shops, restaurants, and movies in downtown Bryn Mawr. Within easy walking distance of parks, universities, and train stations and easy driving distance of Center City, Airport, and corporate centers.